Working out the property division after you and your partner have separated is a distinctly different legal process than the divorce process. The steps are quite similar for child contact and in most instances both matters will be discussed together when you’re in court but it’s important to know that they are separate legal actions. After separation occurs, you can immediately start this process – unlike getting divorced, there is no requirement to be separated for a year before you can apply. Firstly, you need to decide if you want to go down the path of going to court or if you feel you can settle the matter out of court. It’s a good idea to try to settle the matter out of court because it saves both of you money that would only go towards lawyers. You may include property division in consent orders and since 95% of cases that are started in court finish with consent orders anyway, it would be a good idea to make an attempt towards getting some sort of agreement with your ex partner before you go to court. 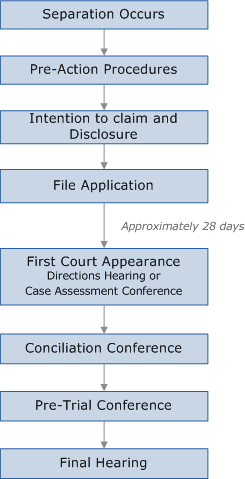 The court requires you to attend dispute resolution before filing an application, so you will be required to at least make an attempt to negotiate before going to court. Your ex partner should then respond to the intention to claim. They may respond by accepting your offer, and in this case consent orders can be drawn up and going to court can be avoided. They may respond by writing their own letter which states their side of the argument. Or they may not respond at all, in which case you’re then able to file an application. If no agreement can be reached, you can start court proceedings by filing an application. With this application, you will need to disclose your full financial details via a financial statement and your ex partner will need to do the same. Failure to fully disclose your complete financial details may expose you to contempt of court charges, to be ordered to pay court costs or pay some other penalty that will affect the final outcome. Assets include anything of value that’s in either or both of your names. Your first appearance in court will give both parties and more importantly the court a chance to decide how the case will proceed. You may have a case assessment conference, which is before registrar, and allows you another chance for you and your ex to reach an agreement. If you cannot reach an agreement here, the registrar may recommend other services to help settle the dispute. If there are any immediate matters that need to have a decision and interim orders made, you will have a directions hearing (before a judge). The judge will decide how the case will proceed and will make any orders he feels are appropriate (eg. Who lives in the marital home; That items may not be removed from the home or sold, etc.). During the directions hearing, you will get assigned a date for the conciliation conference and in some cases a final hearing. A conciliation conference is a required step before going to a trial and is another chance to negotiate with your ex-spouse over property matters. It is conducted by the registrar and you won’t generally appear before a judge and no orders will be made. You will be required to bring all the details of your finances to this meeting, including property valuations, tax returns, bank statements, share and super statements. If, after this meeting, you and your ex haven’t come to an agreement a trial date will be set (if it hasn’t already been). This conference is again conducted by a registrar, and is a meeting for the court to make sure all documents have been submitted to the court and everything is ready for a trial to commence. The registrar will want to know how many witnesses you intend to call and to make sure that all documents have been provided to each party. The final hearing is the “real” court case, as seen on TV. Only 5% of cases that are started reach this point – most will finish by way of consent orders being made. The length of a full hearing will depend on the complexity of the case, but most take 1-2 days. During the hearing, evidence is presented and both parties may be examined or cross examined by lawyers (or you if you’re representing yourself). Witness; family, friends, and new partners, or whomever deemed applicable to the case, may also appear and give evidence. After all the evidence has been presented, the judge will consider everything and deliver the judgment. It probably won’t be delivered immediately after the hearing as the court will take time to consider the case. Orders will then be made and even if you don’t agree with them, you will have to accept them. This will depend on the court, how busy the judge is and how quickly you and your ex partner come to an agreement (or not). It can take 12-18 months or longer to get to a final hearing after filing an application.